The DSCOVR satellite took this photo on July 6, 2015. It’s the first image of Earth’s entire sunlit side ever taken by DSCOVR, which launched in February 2015 and is a joint project involving NASA, NOAA and the U.S. Air Force. Humanity's home planet looks pretty amazing from nearly 1 million miles (1.6 million kilometers) away. 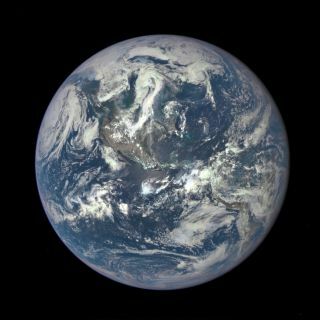 NASA released today (July 20) the first image of the sunlit side of Earth taken by the Deep Space Climate Observatory (DSCOVR) spacecraft from its final science orbit, and the beautiful photo has already made quite an impact. DSCOVR, a joint effort of NASA, the National Oceanic and Atmospheric Administration (NOAA) and the U.S. Air Force, launched in February. Last month, it reached its science orbit at Lagrange Point 1, a gravitationally stable spot about 930,000 miles (1.5 million km) from Earth. The spacecraft's primary task is monitoring the solar wind, which should help improve NOAA researchers' forecasts of geomagnetic storms that can disrupt power grids and other infrastructure here on Earth, mission officials have said. But DSCOVR is also equipped with some Earth-observation gear, including NASA's Earth Polychromatic Imaging Camera, or EPIC, which took the new photo on July 6. EPIC captures a series of 10 different images in a variety of wavelengths, from near infrared to ultraviolet light, which can be analyzed in a number of different ways. As the new photo suggests, the camera is performing well, team members said. "The high quality of the EPIC images exceeded all of our expectations in resolution," DSCOVR project scientist Adam Szabo, of NASA's Goddard Space Flight Center in Greenbelt, Maryland, said in a statement. "The images clearly show desert sand structures, river systems and complex cloud patterns. There will be a huge wealth of new data for scientists to explore." NASA will use the camera's observations to measure ozone levels in Earth's atmosphere and plant growth on the ground, and to build maps showing the distrubution of dust and volcanic ash around the globe, among other things, space agency officials said. "This first DSCOVR image of our planet demonstrates the unique and important benefits of Earth observation from space," NASA Administrator Charles Bolden said in the same statement. "As a former astronaut who's been privileged to view the Earth from orbit, I want everyone to be able to see and appreciate our planet as an integrated, interacting system," Bolden added. "DSCOVR's observations of Earth, as well as its measurements and early warnings of space-weather events caused by the sun, will help every person to monitor the ever-changing Earth, and to understand how our planet fits into its neighborhood in the solar system."